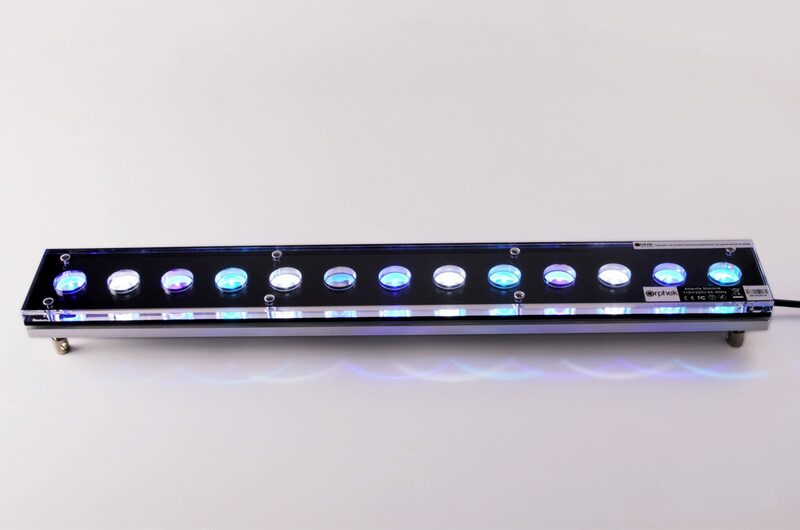 After bringing the Atlantik series one step forward by upgrading it with a new V4 spectrum, Orphek is now introducing to you our newest 24″ Slim Line lights for both Reef and Fresh Water Planted Aquariums. 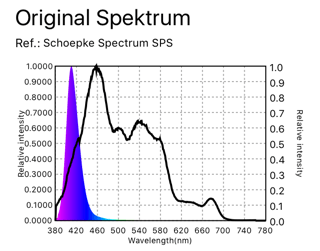 Orphek has already settled the standard in the market for its advanced comprehension of color spectrums and its influence on coral physiology. 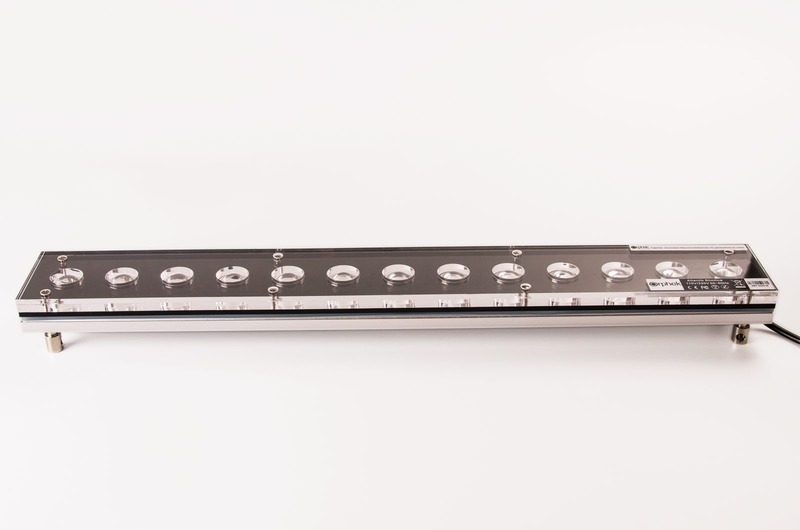 Today we are offering you LED lighting products combining efficient technology, longevity, design and modular flexibility. YES! We believe it is possible to offer solutions that have an outstanding performance, high quality components, exquisite conceptual design that will have more than one application and will answers to all aquarists’ needs. 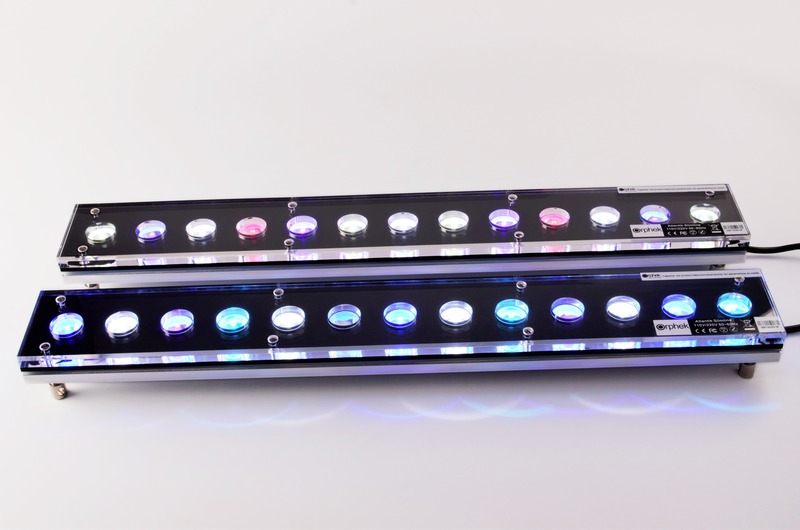 Our 2 new Slim Line lights with spectrums for both Reef and Planted aquariums differ from all slims lights offered in the market today because they are built with the same design and quality of the Atlantik series, made of full body acrylic, a rugged aluminum heat sink and thick polished acrylic lens cover. 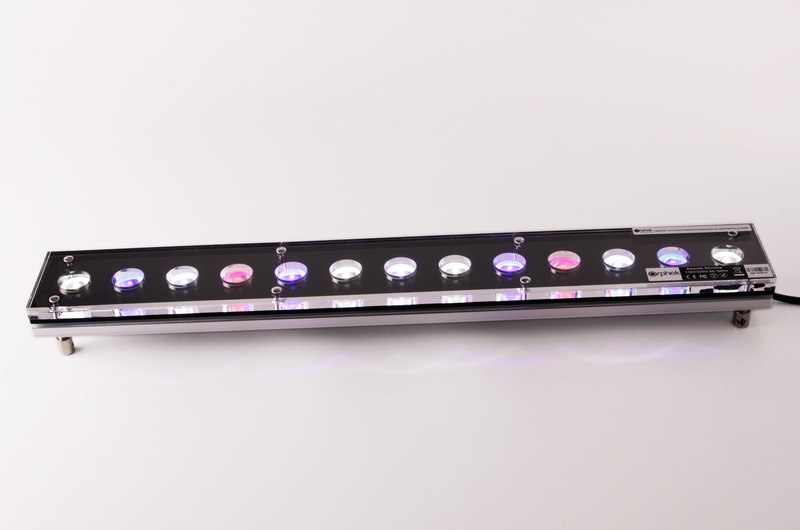 Our light is not only solid and durable, but also beautiful to display! If you have a smaller tank it does not mean that you don’t deserve a beautiful light over it! 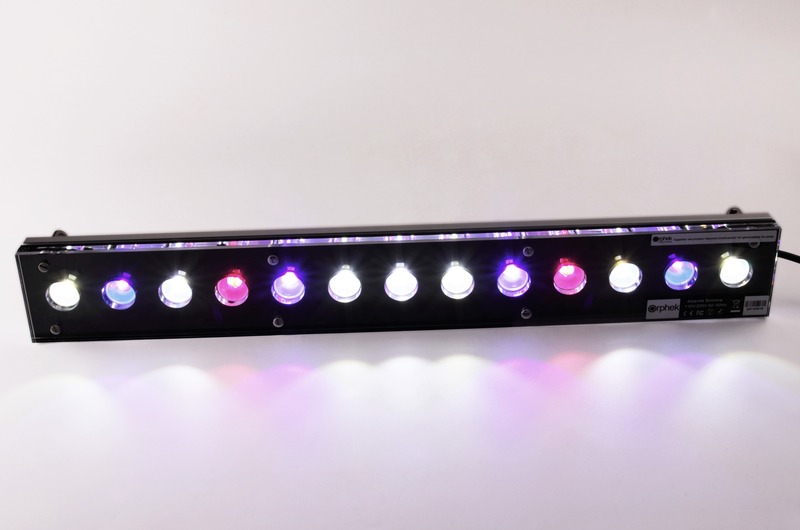 Our 24″ Slim Lines Lights can cover every 101cm/40″ L x 30cm/11.8″ W x up to 60cm/24″ H of your SPS/LPS reef tank or planted frashwater aquarium – that said, if you start with a smaller tank you can always add more lights as you continue to upgrade your tank. 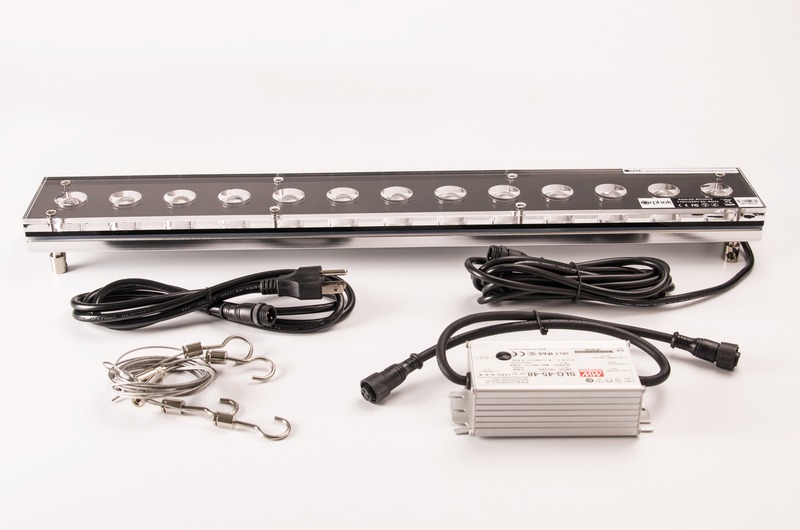 Or you can simply add 01 extra unit for every 1m/40″ L, or 30cm/11.8″ W.
They can integrate tanks where you still have uncovered areas, including mixing them with other Orphek lights, such as the Super Blue Slim Line, Atlantik series and even Orphek pendants! 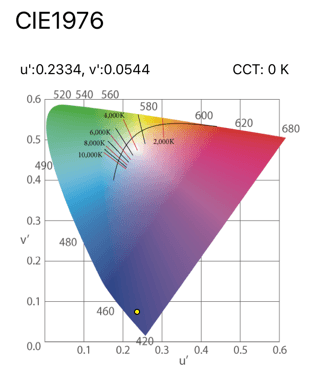 You can replace older technologies such as T5 /T8 systems or any other LED systems with not enough light. 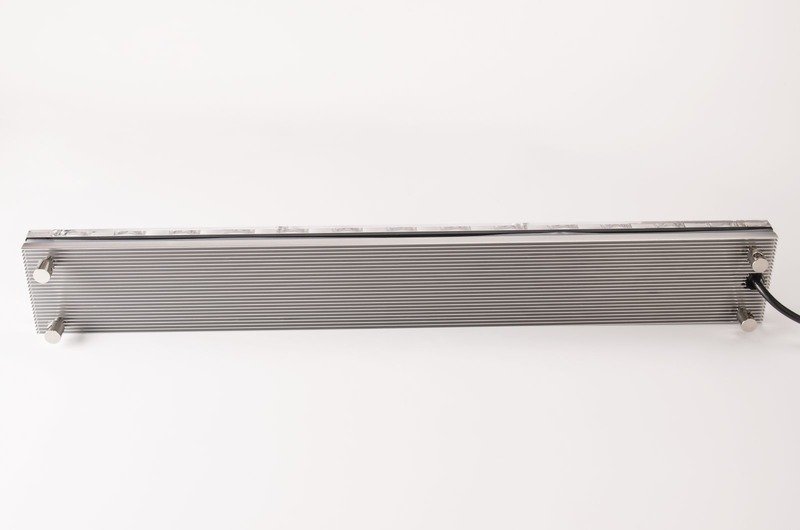 They are perfect for aquariums placed inside a canopies or closed tanks. 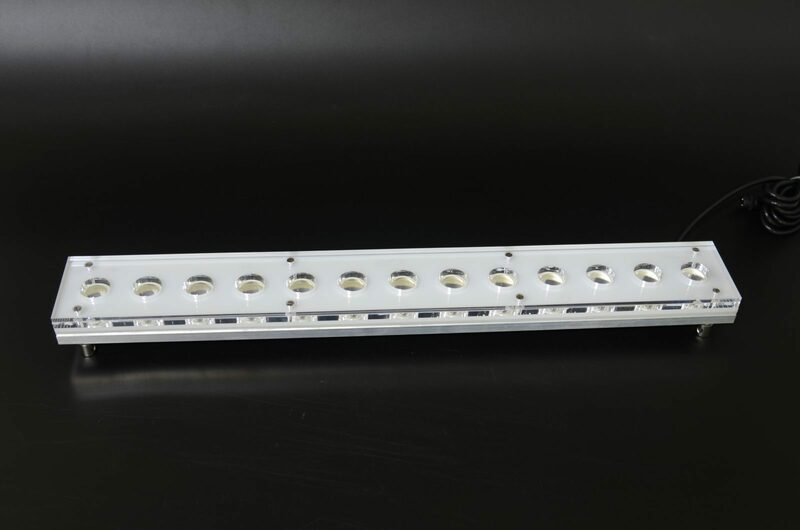 Five watt dual chip LEDs. 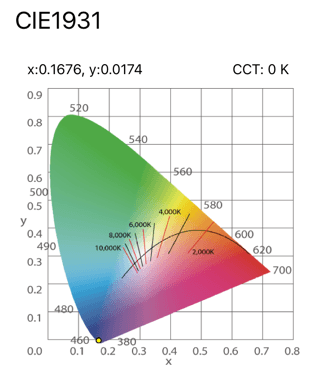 Large convex lenses that are able to disperse light over a wide area and provide excellent penetration. Quality Mean Well SLG-45-48 LED driver with a waterproof quick disconnect cable. Grazie Danilo Ronchi from Danireef.com! Merci Sébastien Ruaux from Récifal News! Chlorophyll A Booster that targets the excitation area of the spectrum to promote chlorophyll A production. On the Hawaiian Reefs coral skeletons were found to contain an average of 13.7% (?g cm?2) of chlorophyll A and 2.6% (?g cm?2) of chlorophyll B. For some unknown reason these levels are much lower in corals from the Red Sea Reefs. Our design goal was simple: To provide a supplemental Violet/deep blue/ light in the low nanometer range that older technology lighting cannot provide. 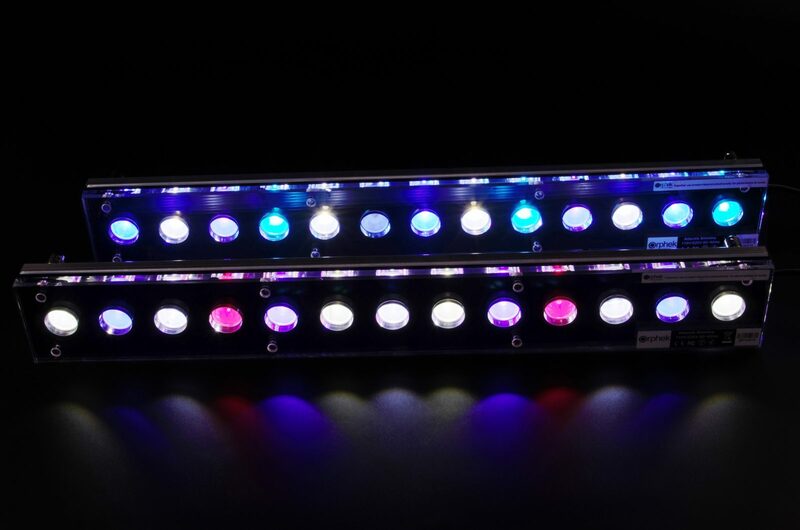 Orphek has always took great pride in providing Violet LED light that no other LED manufacturer can offer, both in spectrum and intensity that compliment excellent coral growth and health. The Atlantik Slim Line LED is the embodiment of this technology and offers a completely different approach and appearance to supplemental Violet LED lighting for reef tanks. 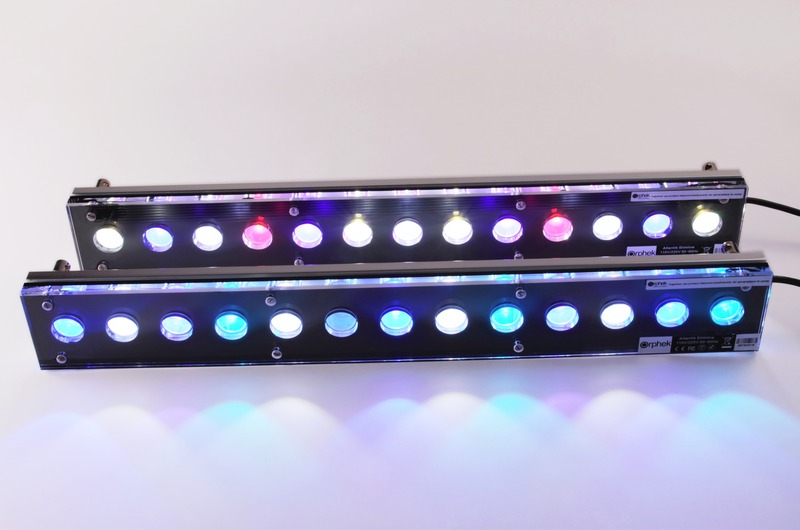 The Atlantik Slim Line Super Blue LED consists of two 420nm and eleven 410nm dual chip ultra deep blue/violet LEDs which provide a combined spectral range of 390 to 440nm. The spectrum the Super Blue Slim Line provides is the closest light you will get to a true Actinic 03 florescent light but with much greater spectral range, coverage and penetration. 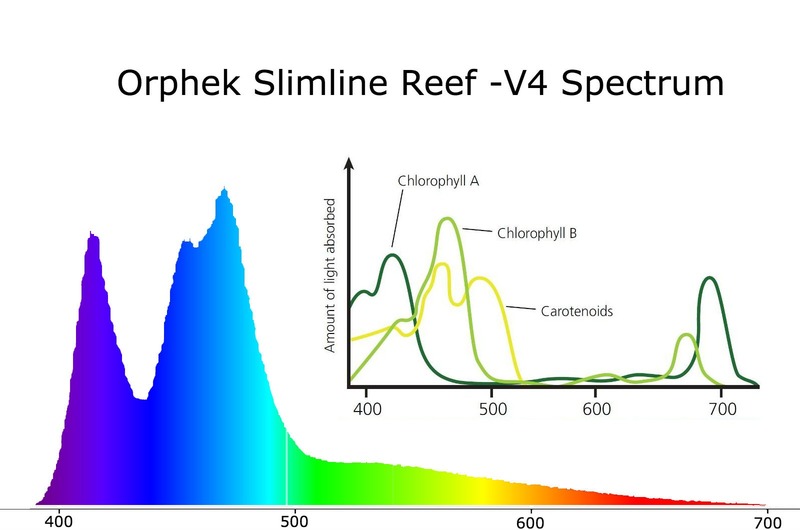 Chlorophyll A required to maintain and grow healthy coral with vibrant colors. 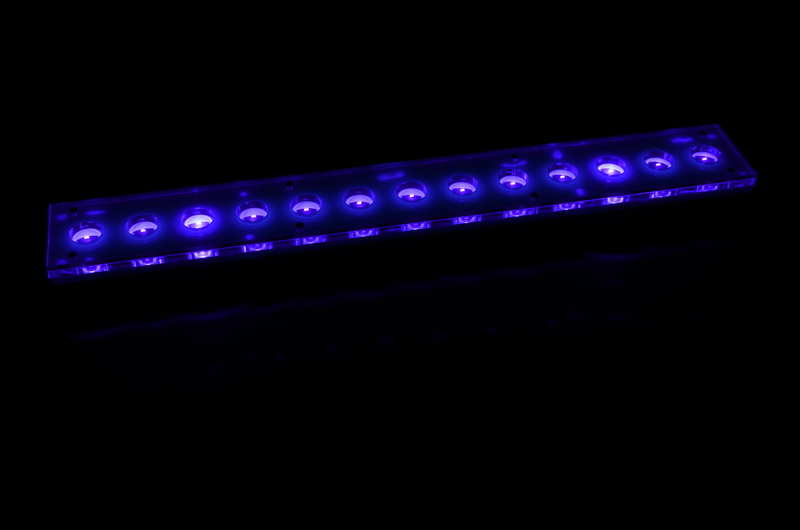 The Atlantik Slim Line Super Blue LED targets the excitation area of the spectrum to promote chlorophyll A production. CAN I WATCH/READ REVIEWS OF THE PRODUCT? 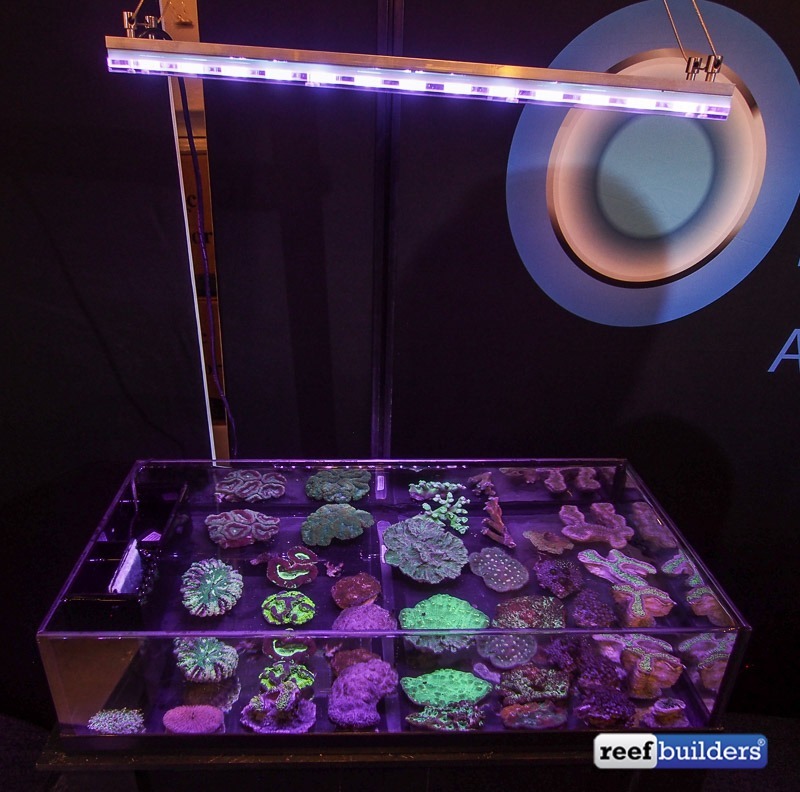 Read what Reef Builders had to say about Orphek Slim Line Super Blue LED. 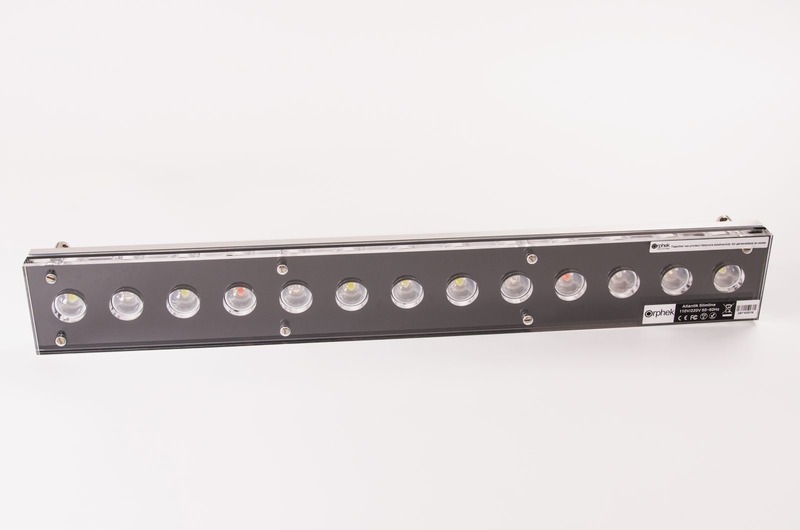 The Atlantik Slim Line LED can be used with older technology HQI and metal halide lighting systems to enhance the lower spectrum that these lamps cannot provide. 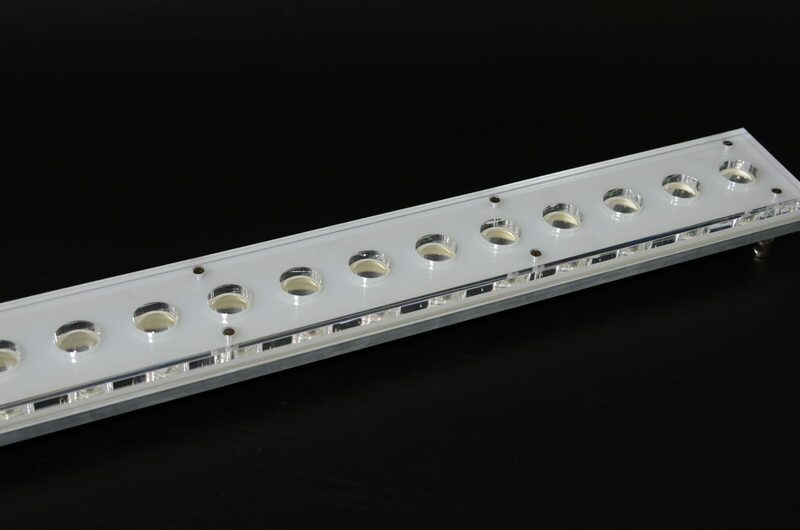 It can also be used with our older models such as the Atlantik V1, V2 as well as our pendant series of LED lighting or any brand of outdated LED lighting systems. 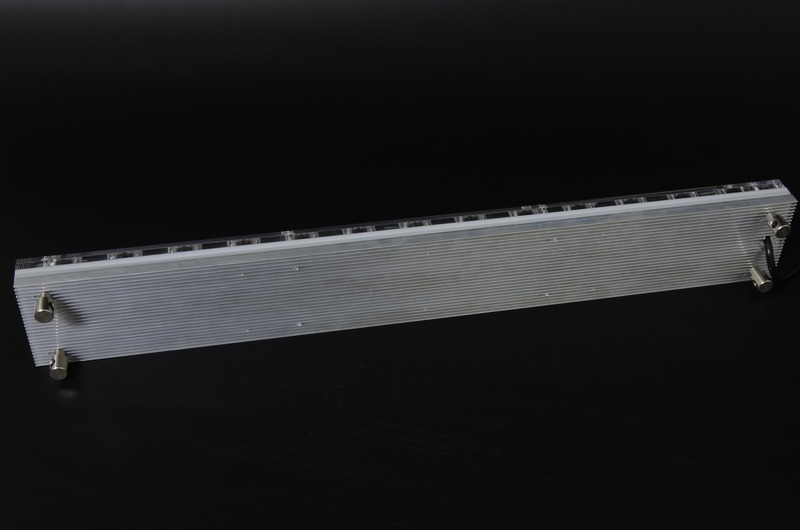 The Atlantik Slim Line can also be custom built to accommodate most applications, including freshwater planted aquariums; coral grow out tanks and Jellyfish tanks. 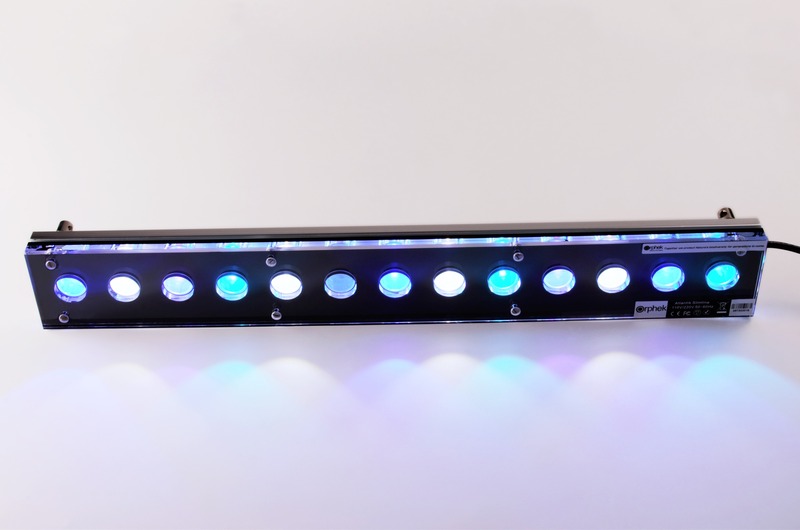 The Atlantik Slim Line is not your typical low power flexible LED strip light; it is built with a rugged aluminum heat sink that passively cools 13, five watt dual chip LEDs. The large convex lenses disperse light over a wide area and provide excellent penetration into deep aquariums. Construction quality is identical to our Atlantik V3+ flagship model featuring a solid one piece heat sink; thick polished acrylic lens cover and a quality Mean Well SLG-45-48 LED driver with a waterproof quick disconnect cable. White acrylic with extruded aluminum housing.